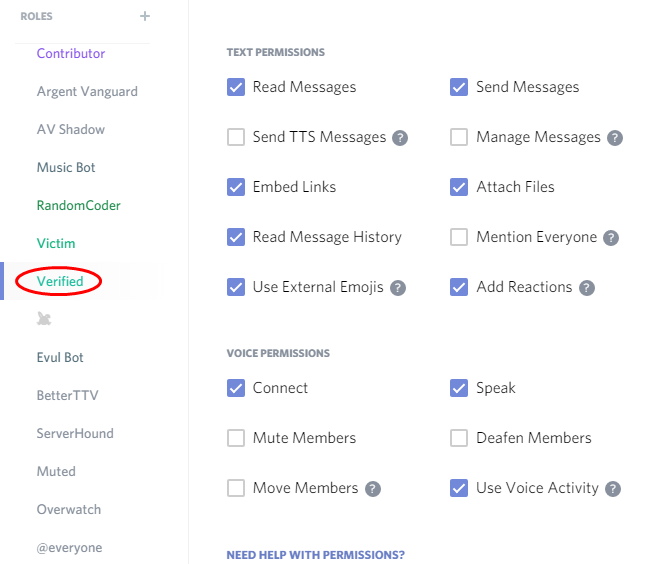 How to correctly set up Discord server and channel permissions? 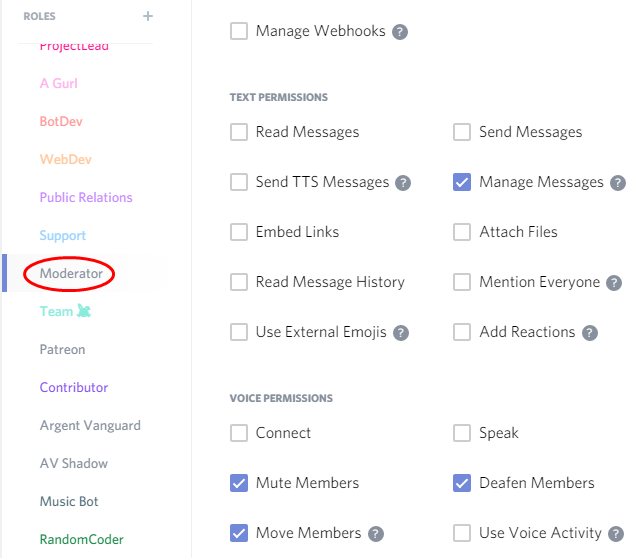 This guide assumes at least basic knowledge of Discord and server configuration. You can watch a video guide here 2 or continue reading this written guide. I’ll start with basic channel structure that will help keep things nice and clear on your server. You can of course structure your server differently, but this should give you basic idea of what works well. 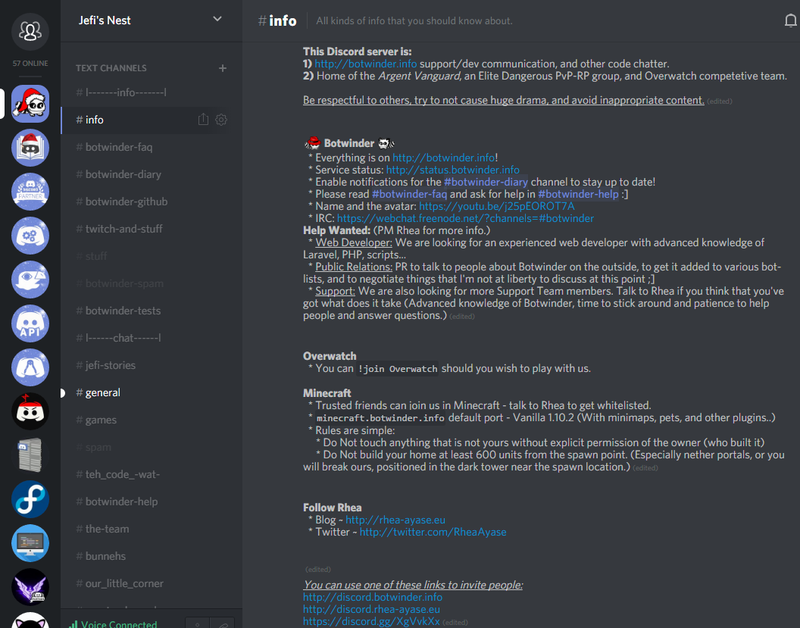 I personally usually list discussion channels first and info/news channels in the bottom, Jefi’s Nest is a little bit of an exception to that. In the l-------info-------l channel separator you can see a list of public info and news channels and brief description of each, similar list can also be found in the l------chat------l separator. I also added a list of roles here, to not clutter the #info channel too much. Less information and better structure often mean that the user will actually read it, although they very rarely do. Brief description of the server - This would be just one or two sentences what the place is. 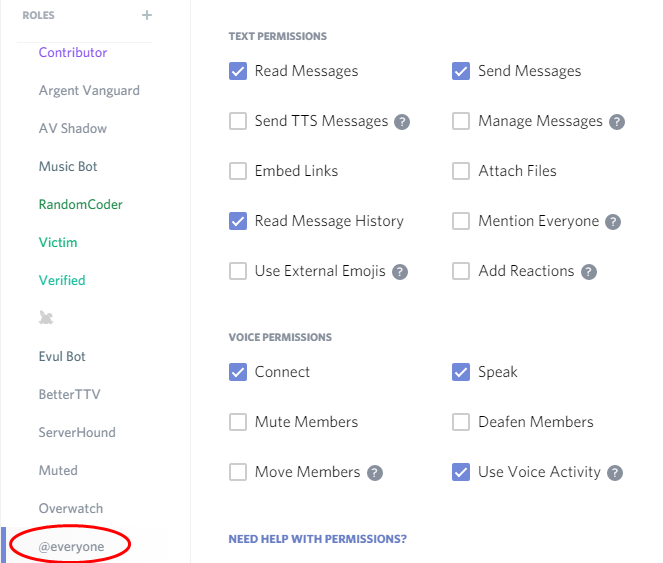 More detailed description of the activities the user can participate in - In our case this would be some information about Botwinder 1 and Overwatch. 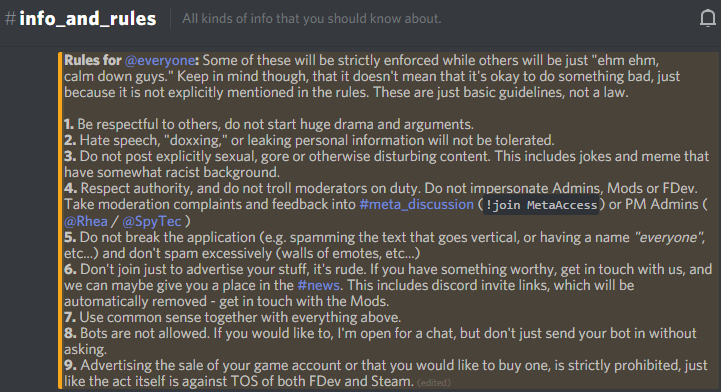 If you have a bot with Public Roles, just like our Overwatch, this is the place to list all of them, or any other services your bots provide. Permanent invite link - this is to prevent people from accidentally generating only temporary invite links and hanging those in public places. Simply take away their permission to do that and give them a nice permanent link. Another read-only type of channels for public, where you or your staff will post the news about the server, community, activities and events, in case of gaming community maybe patchnotes and game updates, etc… In our case we have github updates with a bit of spam for instant updates about our project, and more importantly, #botwinder-diary which contains important news and notices. 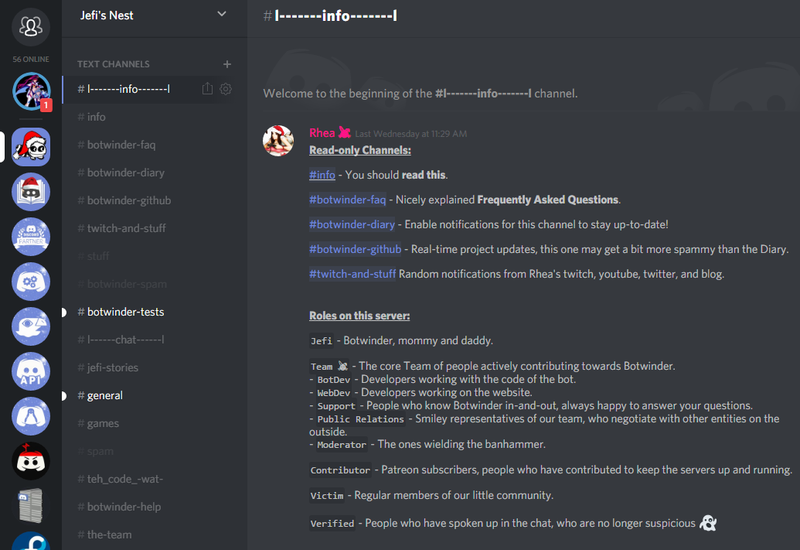 Discussion channels can be themed, for example in our case #botwinder-help is a dedicated channel for questions about Botwinder 1 or other kinds of help with it, then we’ve got #teh_code_-wat- which is for code related discussions. 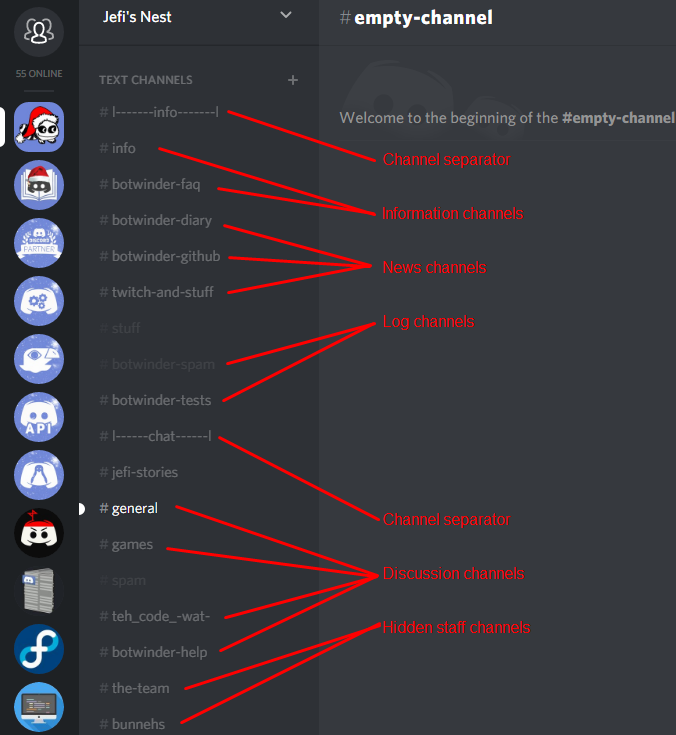 Themed channels should be obvious what’s the purpose form its name, and topic if necessary. A simple spam-type of channel often called #bot-playground, #memes or #offtopic. 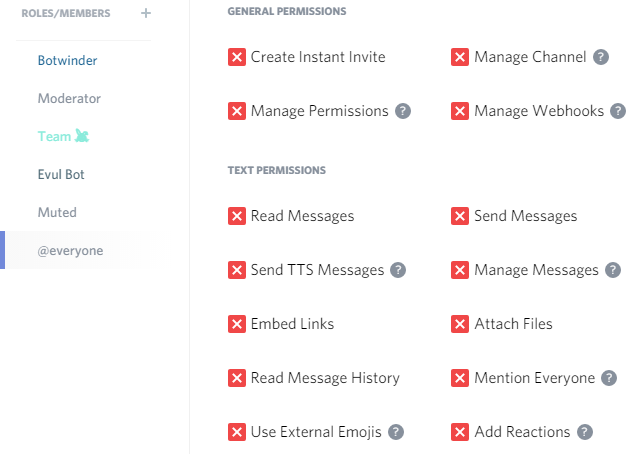 Roles that serve as tags only, should have no permissions at all. See example Overwatch tag role in Fig.7. 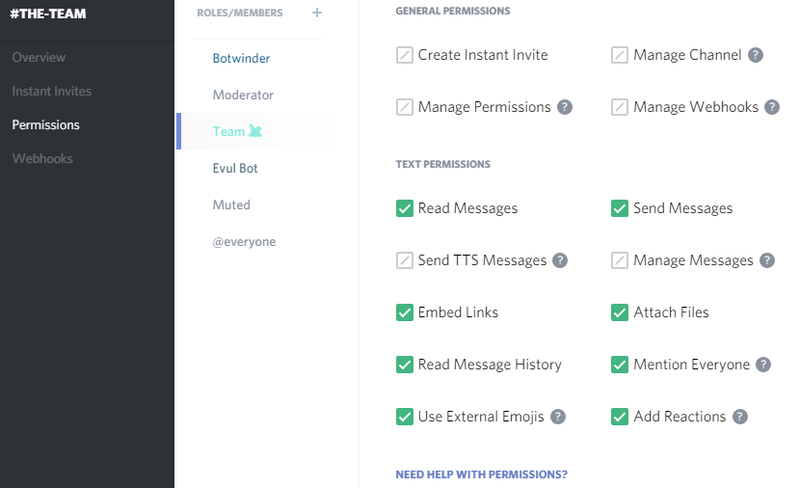 Tags are often available to public via bot command, aka Public Roles, and as such you do not want people to be able to grab any permissions at all, not even the ones that are on the @everyone role. Staff roles should be treated as more fancy tags that are not available to public, and should have no permissions, or only permissions needed for the staff. 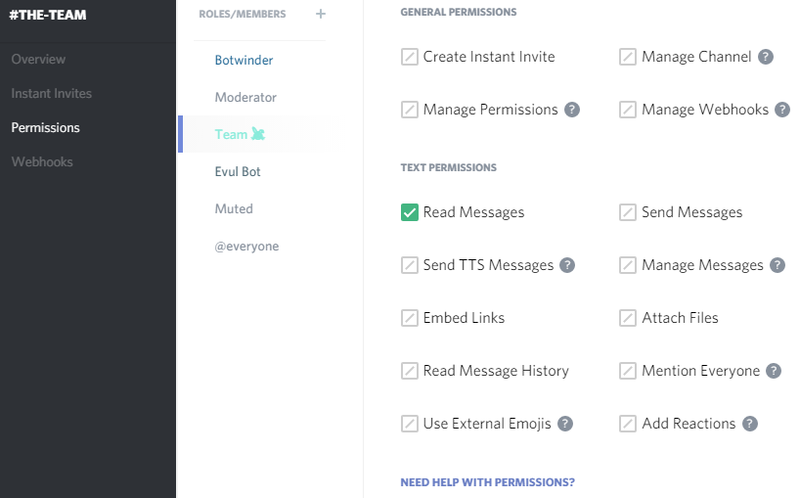 See example moderator role in Fig.8 which doesn’t even have ban permissions, because we use a bot for that. Standard random discussion channels should have no permission overrides at all. 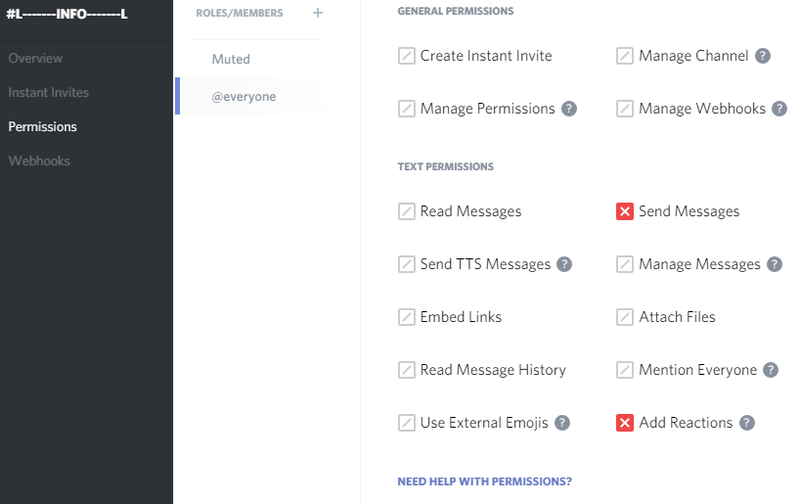 You can create some Spam (refer to channel types) channels where you want everyone to be able to upload files and not just verified members, etc… but other than that, you should not explicitly give people permissions if they don’t need them, if they already have them from server role permissions. See Fig.9 for an example. 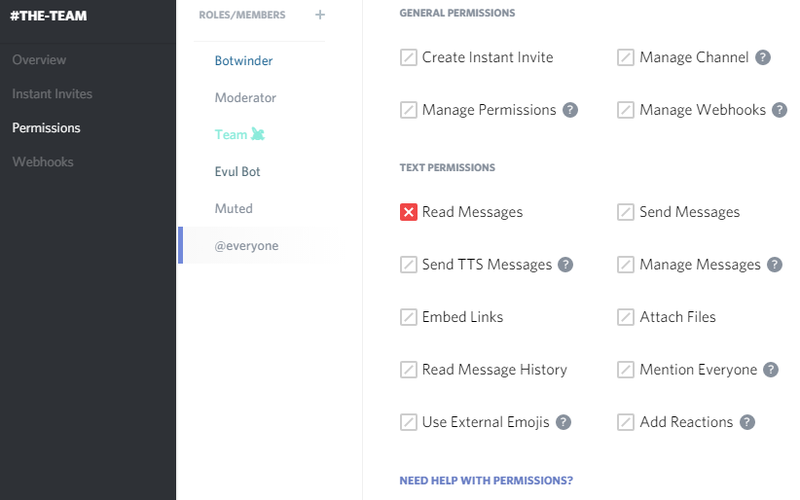 Hidden channels, such a channel for moderators or staff, would have only a single permission denied from @everyone, which is to Read Messages, and then the Staff (or any other) role that you want to give access, should have the Read Messages permission explicitly allowed. See Fig.10 and Fig.11 for examples. Wallpapering is an act of making the whole channel permissions red, or green. It is extremely wrong! Do Not Do That!! If you have staff role, set up permissions as explained above. Do not wallpaper it as shown in the Fig.12 and Fig.13! The last bit I would like to mention is voice channel for music bots. All you need is to simply apply already explained principle of minimal permissions necessary. 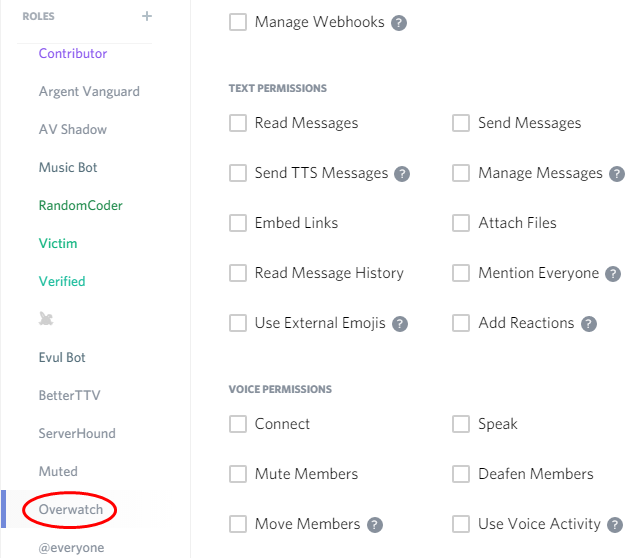 I assume that the @everyone role has connect and speak permissions. All we need to do now, is to block this role from being able to speak, and adding a music bot (or its role) and allowing the Speak permission. I hope that this guide was useful for it, feel free to ask questions or share your opinions and experiences in the comments below. Read my other article On the topic of Moderation.